If you’re considering a kitchen renovation, perhaps the idea of white cabinets has crossed your mind — specifically, white Shaker-style cabinets. If so, you wouldn’t be alone. 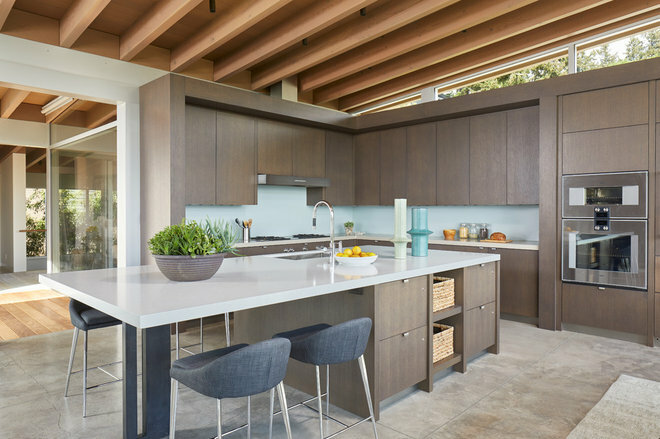 The 2019 U.S. Houzz Kitchen Trends Study gathered information from more than 1,300 Houzz users who had completed a kitchen remodel or addition project in the past 12 months, who are working on one or who are planning to start one in the next three months. Here are five design trends for kitchens based on what they are saying. 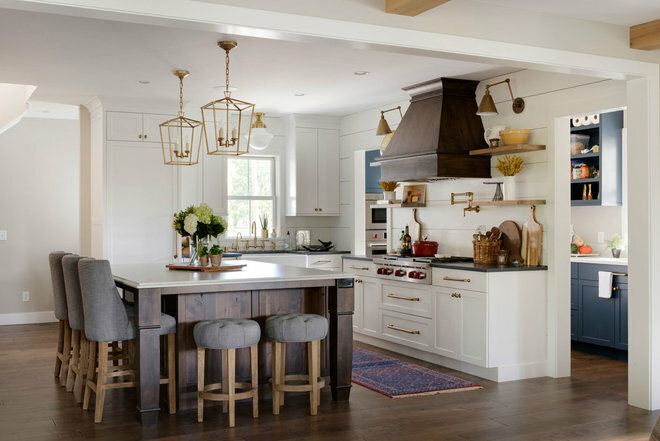 This farmhouse-style kitchen features a rustic wood island and range hood, and shiplap on the walls. Eighty-two percent of homeowners who are renovating their kitchens are changing its style as part of the project, and the most popular style after renovating is transitional (21 percent) — for the second year in a row. Contemporary (15 percent) came in as the second most popular style, as it did the year before. Farmhouse is now the third most popular kitchen style (14 percent) and chosen nearly as frequently for upgraded kitchens as contemporary. 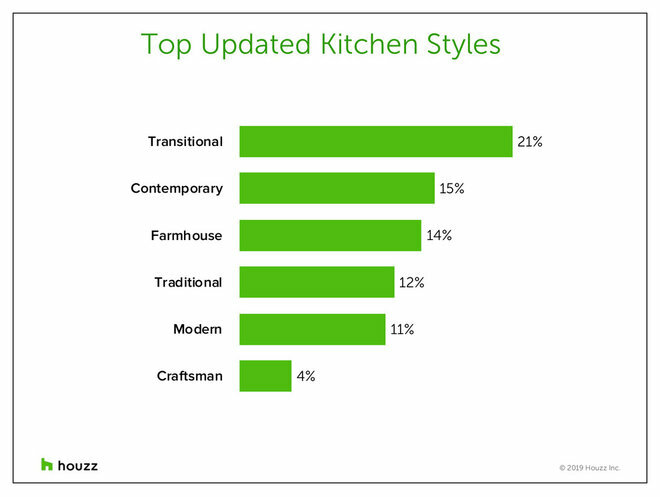 The next most popular styles for renovated kitchens are traditional, modern and Craftsman, according to the study. It’s worth noting that farmhouse style has been gaining fans for remodeled bathrooms as well. This transitional-style kitchen has Shaker-style cabinets. 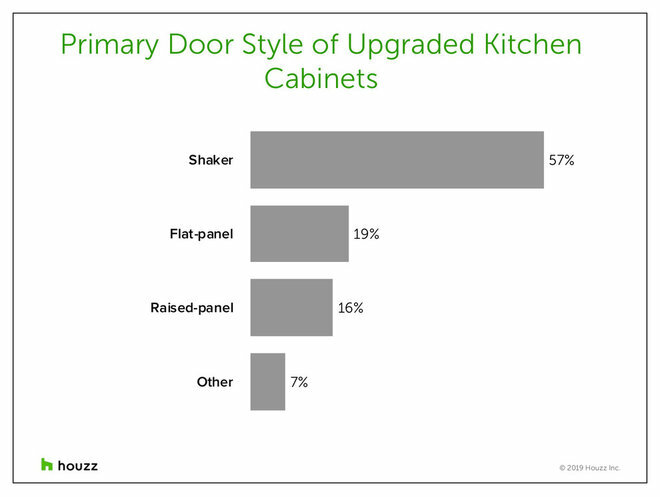 Shaker, a kitchen cabinetry classic, and other recessed-panel doors continue to be the top choice for cabinets, with 57 percent of renovating homeowners selecting them. Flat panel is the next most popular door style, followed by raised panel. Two in 5 homeowners (41 percent) remodeling their kitchens are choosing custom cabinets, while one-third (33 percent) are choosing semicustom cabinets. About one in 10 are choosing stock cabinets (12 percent) or ready-to-assemble options (10 percent). 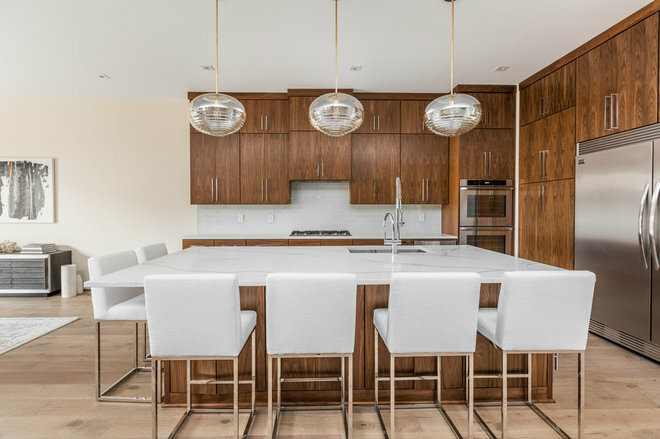 This contemporary-style kitchen is designed with flat-panel wood cabinets and shiny chrome hardware. White continues to be the No. 1 pick (43 percent) for cabinet color, followed by wood (25 percent) and gray (11 percent). The majority of renovating homeowners (54 percent) are mixing metal finishes in their fixtures and hardware — which include faucets and other plumbing fixtures, as well as lighting fixtures and cabinet and door hardware. 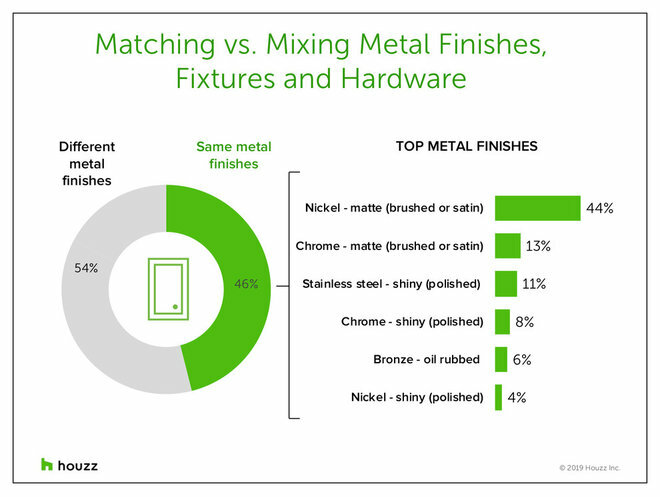 Among those who are selecting a single finish across fixtures and hardware (46 percent), matte nickel is the top choice, followed by matte chrome and shiny stainless steel. Matte nickel is the top finish among renovating homeowners who select a single primary color across their kitchen fixtures and hardware whether their cabinet color choice is white, wood or gray. More than half (53 percent) of renovating homeowners are opting to make their kitchens more open to adjacent rooms. And many renovating homeowners are installing kitchen islands. The most popular new kitchen built-ins are tall built-in cabinets that can serve as a pantry (40 percent), followed closely by kitchen islands (38 percent). Breakfast bars (19 percent) and wine fridges or wine racks (16 percent) are also popular among renovating homeowners, though less so than kitchen islands. The majority of renovating homeowners upgrading their kitchens (78 percent) are upgrading their cabinets, with many including specialty cabinetry storage. 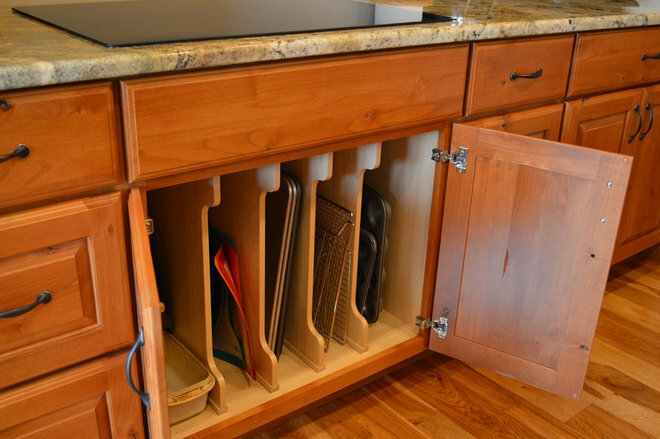 Cookie sheet and tray dividers are the most popular cabinet organizer (54 percent), followed by deep drawers (41 percent), spice organizers (38 percent) and cutlery organizers(36 percent). Among specialized drawer types, pullout waste or recycling drawers or trays are the top pick (68 percent), followed by revolving or Lazy Susan drawers or trays(44 percent) and pullout or swing-out drawers (42 percent). 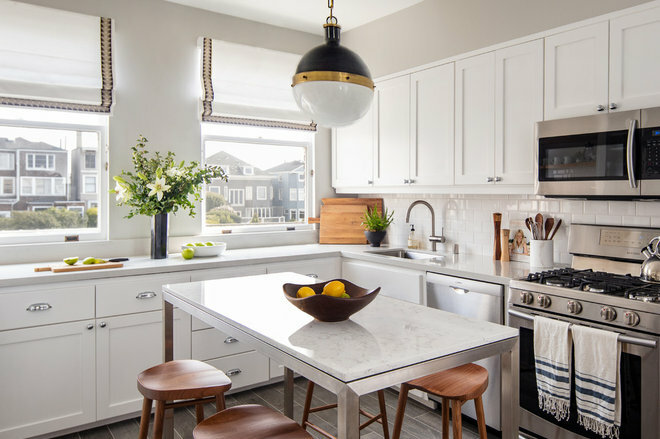 The 2019 U.S. Houzz Kitchen Trends Study gathered information from 1,337 Houzz users who had completed a kitchen remodel or addition project in the past 12 months, who are working on one or who are planning to start one in the next three months. The study was fielded between Sept. 18 and Oct. 19, 2018.